The Current Month VWAP is the volume-weighted average price (VWAP) of a security for the current trading month. The VWAP gives a fair reflection of the market conditions throughout the trading month and is probably the most popular benchmark used by large traders. The Library VWAP version can be compared to the Premium VWAP version here. The Current Month VWAP is the volume-weighted average price (VWAP) that reflects how the asset’s market price has developed during the current month. The VWAP takes into account trading volume such that large trades will have more impact on the benchmark price than small ones. Many institutional traders have their trade execution measured by volume weighted average price (VWAP). Because their execution is measured as good or bad by how far away they were from the average price, they will try to buy as close as possible to the VWAP. 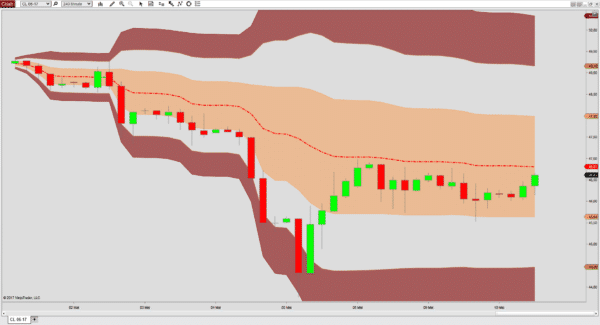 Accordingly, there are two ways of using the VWAP, namely as trend filter or as support and resistance indicator. The Current Month VWAP can be set to calculate for the entire trading month or it can be set to calculate for custom hours such as the regular session. When a custom session is selected the VWAP calculation will pause outside the selected custom hours. The VWAP further comes with volume-weighted standard deviation bands. Although the VWAP uses volume information, it is best set to “Calculate” = “On price change”. It is not necessary to recalculate it with each incoming tick. The indicator that can be downloaded here will calculate an accurate VWAP and accurate bands when applied to high resolution charts. When used with higher timeframe charts, the plots may be one or a few ticks off the correct value.